Well, seeing as the show is about to go into it's final few shows, I think you can see that we did not get chosen to appear on the show. I'll just come out and say it, I believe the judges or producers or casting folk, made a mistake in not choosing us. BUT, I'm not upset about it........(anymore, lol) At least they called us 'The Best Dressed Act' while we were there. 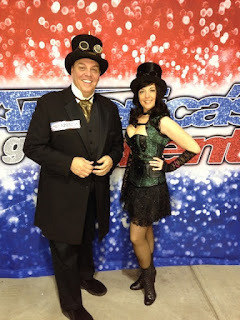 We auditioned in Charleston SC. We gave it our best shot, and for whatever reason we were not chosen. Will we audition next year? Hard to say. We are considering trying out in another country. Given the fact that many of the acts this year on AGT were not from America, we may go elsewhere and try out. I have friends who have appeared on Got Talent shows from other countries, so it's certainly a viable option. I do want to add this, I don't envy the producers job at all. The process they must go through just to locate just a few acts after viewing tens of thousands of performers, ugggh, that is one job I wouldn't wish on anyone. They do an incredible job with the show. The acts, for the most part are great. My favorite this year was Puddles the Clown, who I think got eliminated early. He should have won the whole thing. I generally like the magicians, some more than others. I loved the Clairvoyants from last year and wished they had won. This year among the magicians I think Eric Jones was great and I'm sorry he was eliminated. But the young girl ventriloquist will win. I knew that after watching the first episode. You watch, I'm posting this before the big finale show, so check it out and see if I got it right. I have no doubt I have nailed it!